Hay House, Inc., 9781401944551, 240pp. After three years of living his dream as a professional baseball pitcher, Mike Robbins had an arm injury that benched him for good, and when this happened, everything changed. He had to figure out who he was without the identity of “baseball player”—a process fraught with emotional highs and lows—and he quickly realized that the self-criticism and self-doubt he was feeling are in fact epidemic in our culture. Too often we base our value on our external world—our jobs, finances, appearance, or various other factors. Even the most successful people struggle with their relationship with themselves. In Nothing Changes Until You Do, Mike looks at this delicate relationship and brings to light a new way to look at life, opening your eyes to your innate value. These 40 inspiring essays, which are real tales from Mike’s own life and the lives of his clients, boil down some of the most important lessons Mike has learned on his own personal journey—and as he’s traveled throughout the country for over a decade speaking to groups of all kinds. 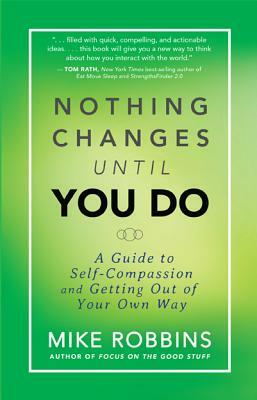 With themes spanning from the importance of trusting yourself to the benefits of vulnerability to the strength inherent in embracing change, this book shows you how to get out of your own way and make peace with yourself. With humor, authenticity, and ease, Mike illustrates that with a little self-compassion and a healthy dose of self-acceptance, anyone can turn away from the negatives that manifest because of a critical self-perception—things like unkindness, insecurity, addictions, sabotaged relationships, unnecessary drama, and more. Making peace with yourself is fundamental to happiness and success. So join Mike and learn to have more compassion, more acceptance, and more love for yourself—thus giving you access to more compassion, more acceptance, and more love for the people (and everything else) in your life. —Eric Severson, senior vice president of Global Talent Solutions for Gap Inc.